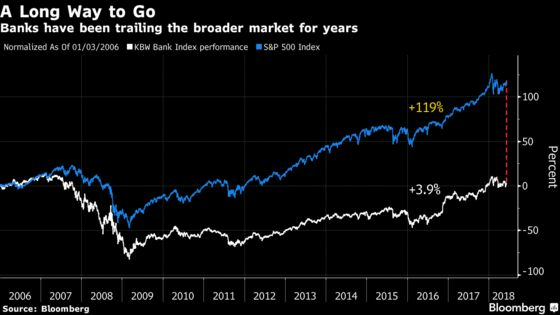 (Bloomberg) -- Bank shares may be “better positioned than ever before,” after years of dragging with price-earnings ratios trailing their historical averages, Oppenheimer & Co.’s Chris Kotowski writes in a note. He flags his favorite stocks -- Bank of America Corp., Citigroup Inc., CIT Group Inc., Goldman Sachs Group Inc. and Jefferies Financial Group Inc. -- and sees banks outperforming by 500 to 1,000 basis points over the next 12 to 18 months. 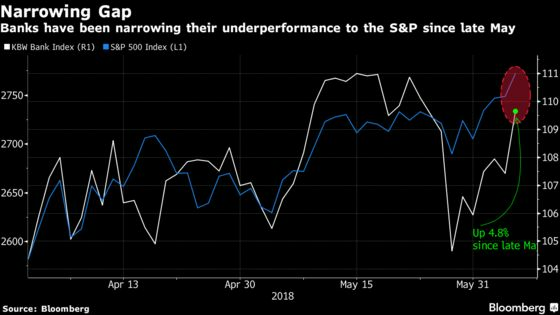 Investors are also keeping an eye out for a potential bank share catalyst with Federal Reserve stress test results that have been expected to be more challenging this year than last. The Comprehensive Capital Analysis and Review (CCAR) is due at the end of this month.